We woke early and the lady of the house served us a lovely breakfast one the balcony. We ate, drank coffee, and watched the kids go to school in the old Palace. 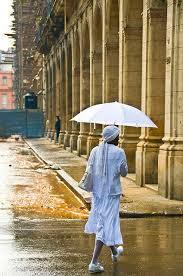 Because I wanted us to have a genuine Cuban experience, we included a half day tour of the local religion. Our guide met us at exactly the appointed hour. He was a dignified fellow, perfect English, and his other job was as a court recorder. 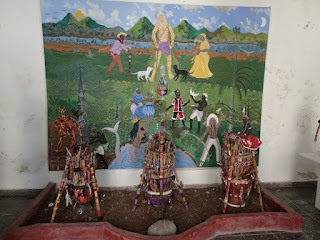 We were taken to the Museum of Orishas - Saints of the Santeria. Our museum guide gave us a wonderful tour of all the dioramas depicting the various saints, their domains, and the history of the West African religion that came with the slaves back in the 1700's. We learned about the Orisha of the water, of fire, or war, or metallurgy, of justice, health, food, scarsity, anger, happiness, etc. Sound familiar? Sorry, no photos were allowed inside and there are none of the internet as well. The museum staff were especially watchful to make sure no one broke the rules. Outside we were able to take photos of the museum shop. Next our guide took us to a street museum of local Santeria artist Salvador. He has transformed a local alleyway into a wonderful outdoor and whimsical display of his art, sculpture and paintings. Our guide there was a quirky, well educated Cuban hippy that chain smoked cigars and bobbed his red Afro when he talked. Next our guide took us to a local Catholic church to see how the people have blended the two faiths. At first it looked like a regular church with saints and candles and stained glass and a traditional altar, etc. Then we say mixed in statues and altars for the Orishas with money and food offerings. What we learned is that this not voodoo. It is a blending of the religions of Africa that were brought over with the slaves and melded with the Catholic faith. We were introduced to the White People, those on a spiritual journey of awakening that dress intirely in white as they work through their prayers and penance to achieve the goal of wholeness. 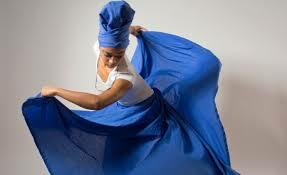 It was all very, every interesting and gave us some insight into the Cuban culture. 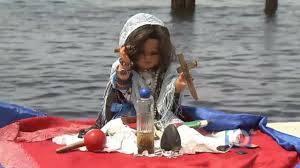 Santeria is part of the music, food, and art and offers people a way of life, rules, and guidance to get through hard times. During the revolution and afterwards under the communist control when religion was banded, they worshiped in caves, basements, and in hiding as the churches were locked. We said goodbye to our fellow back in the city center and headed out for a free afternoon to include lunch and a visit to the capitol and the Museum of the Revolution. We stopped at a local bar and had a nice lunch and some brew. There was a local band and some dancing!!! Ole!!! Afterward we wandered the streets looking into shops and such until we reached the capitol and the museum. The Museum of the Revolution in in Batista's old Presdiental Palace. It was under renovation, was a magificant building. The displays were moslty photos and some artifacts and of course all about Che, Fidel, the fighting and battles, and the result. The place was crawling with tourists...few Americans...and hundreds of college students (those in the tan militarish uniforms). And then outside the toilets on the main floor was this...notice the presidents are all Republicans. I stood there staring and an older woman came up to me and starting speaking about the display. We chatted Spanish for about ten minutes. She asked me who was missing and of course I said Mr. Clinton and Mr. Obama. She blessed herself and went on and on about how the Cuban people loved them both, especially President Obama. Then I asked her about Mr, Trump and she motioned to the wall and said their is still room for him. We ended out day at the same restaurant as the night before. Tired, invigorated, and ready to take on the next day.